Can the Kinect be used to create an immersive experience? Many consumers see the Kinect as still in its infancy, and not yet able to offer a truly immersive experience. However, current trends in technology suggest that devices are moving away from physical peripherals, such as a keyboard and mouse, and towards a Natural User Interface (NUI). This project is an exploration of how to utilize the Kinect to create a more sophisticated immersive experience, that can’t be replicated with traditional peripherals. The development for the interactive experiment has included, character modeling and texturing, motion capture animation, scripting, and visual programming. Through the use of the Kinect’s ability to track a user’s head location, and using that information to modify an in-game camera in real time, I have been able to create a sense of parallax with a projected virtual environment. Combining this with an engaging character that challenges the user to reflect on their relationship with media and cues the user to perform specific physical actions which it responds to, the user will be engaged. 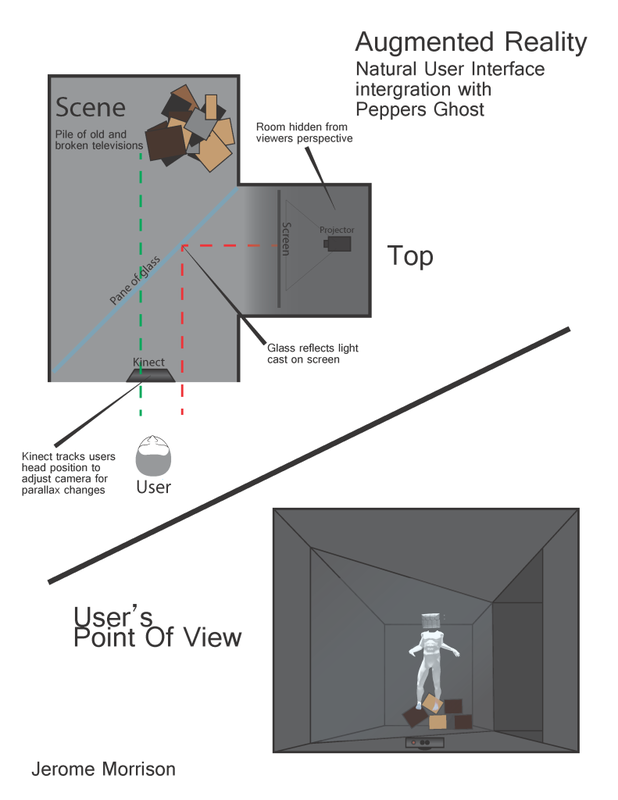 By placing this character within an optical illusion known as Pepper’s Ghost, where an image projected onto glass appears to float in midair, I have discovered a means of utilizing the Kinect to create an immersive experience. The paper can be viewed in it’s entirety HERE.